After completing assigned routes, TTSD trucks arrive at the facility entrance. Each truck is weighed at our certified scale to determine the amount of material collected and its source, or area. 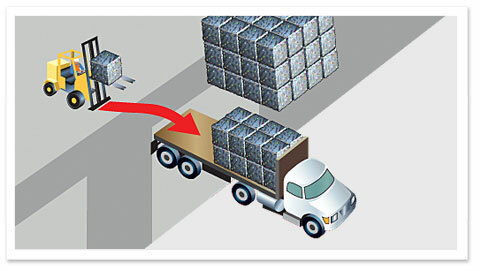 After weighing, trucks dump their loads onto a tipping floor to begin processing. A front-end loader pushes the material into a sort pile, where ground crews remove bulky items (e.g. appliances, oversized wood) and an excavator feathers material onto a large, rotating belt. The belt lifts the material to an elevated platform and continues past a series of sorting stations. Each station is assigned a specific recyclable item (e.g. paper, cardboard, aluminum cans, glass bottles). Workers remove the designated materials and drop them down a chute into individual holding bays. Unsorted items remain on the belt and pass through a portal into the transfer station where they are fed across a fines shaker and dropped onto the floor to await removal to the waste transfer truck. 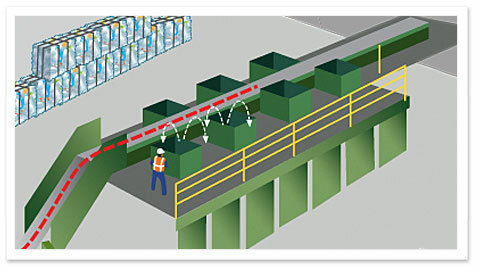 When the MRF bays containing recyclable materials are full, a front-end loader pushes the items onto a ground-level conveyor belt. Workers conduct a final check for contaminated items before running the conveyor into a large bailer. Bails of recyclable material are stored until there is enough material to fill a truck shipment. Truckloads of each material are then sent to recyclers throughout California and Asia. 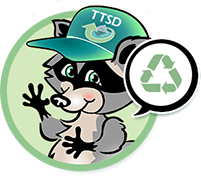 After the sorting process for recyclable materials is complete for both residential and commercial garbage, the final residual material is top-loaded into “possum belly” transfer trucks and hauled to a landfill. With the hard work and effort from everyone at Eastern Regional Landfill, the facility boasts a over 50% diversion rate. Our primary goal is to keep as much recyclable and reusable material out of the landfill as possible. 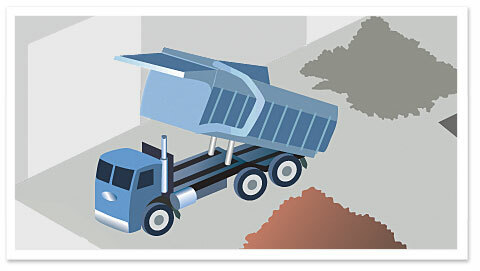 Front loader or debris box truck dumps collected residential wastes on the Materials Recovery Facility floor. Residential wastes processed average 120 tons per day on an annual work week basis. Crane (not shown) slowly feeds garbage from the pile onto a lower conveyor belt. Large items including wood, metal and appliances are removed by the crane and placed in separate dumpsters. Ground level sorters also extract large recyclable items including green bags. Remaining bags are sliced open to allow more even distribution of material prior to its trip to the upper belt. 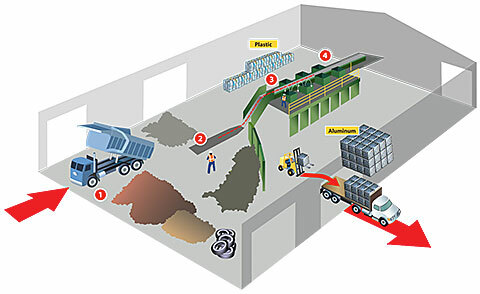 After the initial processing, the mixed solid waste (MSW) travels up an inclined belt where it drops onto a horizontal second-story belt. 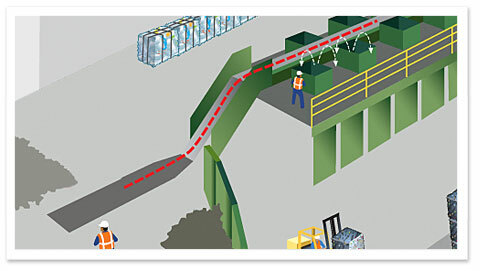 The belt moves the rubbish between lines of sorters who remove recyclable material by type. Large items such as cardboard and newsprint are removed first to allow greater visibility to smaller items such as glass, plastic and aluminum. At each category line position, items are thrown down chutes to specific holding hoppers. Later, the individual hoppers are emptied onto a third belt where the material is examined for contaminants prior to bailing for shipment to recyclers throughout California and Asia. Garbage continues on the belt through a portal into the commercial section of the facility across a shaker unit which removes fines, and then onto the floor. There, the remaining waste is pushed into a transfer trailer located in a sub-level loading bay, and then hauled to Lockwood Landfill for direct burial. Bales of recyclable items are stacked and stored until volumes, weather and/or market conditions warrant shipping. Green bag items and appliances are taken to the topside area of the facility and processed for diversion programs.